Chemrey Angchok is the most popular festival celebrated in Ladakh. This festival is celebrated for two days with great joy. It is a vibrant and rich celebration which attracts a wide range of tourists. It is a monastery festival which is celebrated at a lovely destination of Ladakh. Chemrey Monastery is the venue of the festival. It is located in the picturesque valley of changla which is 45km away from Leh. This two day-carnival is celebrated on the 28th and 29th day of the ninth month of Tibetan calendar. This festival is dedicated to Drugpa order of Tibetan Buddhism. It usually comes during winter in the month of November. These two days people participate in various music acts and theatre performances. They dance in joy and happiness. Dancers wear colorful robes and masks and dance to the folk tunes. This festival is also known as festival of sacred dances. The chemrey monastery was found in the year 1664 by Lama Tagsang Raschen and is dedicated to king Sengge Namgyal. About 20 monks reside in this Monastery. This comprises of two assembly halls (Du-Khang) which were built at two different times. One hall consists of paintings of founder of the monastery Lama Tagsang Raschen and the other consist of images of Padmasambhava. 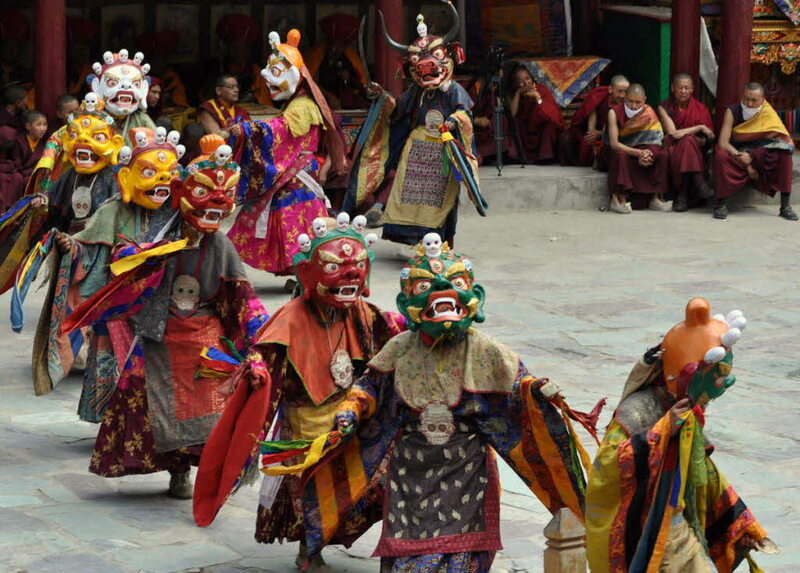 Most of the festivals in Ladakh are celebrated based on the Monasteries and Gompas. Chemrey Angchok is one such festival which is celebrated annually and this chemrey monastery is centered on Shachukul monastery. This monastery is located 14,000 feet above the surface. The dance performances held on these two days will portray the victory of good over evil. They also portray lives and the stories of Buddhists and Tibetan divinities. A wide range of scriptures are exhibited in which the title pages are found in sterling silver and the text in gold letters. One can also find murals of Sakyamuni, Kalchakra, Akshobhya and thousand Buddha here. A cave which is believed as the abode of Padmasambhava is also found near to the venue of the festival. It is believed that Padmasambhava had spent one of his meditation periods here. This festival draws the attention of national and international tourists towards Ladakh, the Himalayan city. It is celebrated only at chemrey monastery, Ladakh. Ladakh: Ladakh is located in the state of Jammu and Kashmir. Thousands of tourists from all over the world prefer to visit Ladakh in the month of November to enjoy this popular Chemrey Angchok festival. One can interact with the local people and know more about the culture of the area. Tourists get a chance to experience walking and dancing above 10,000 feet along with the local people. Getting there is also easy. One can reach there by air or road or rail. The nearest airport is Leh which is 45km away from chemrey monastery. Direct flights are available from major cities like Delhi, Mumbai, Bangalore, Jammu and Srinagar.